Thanks so much for taking the time to do this! It was a tremendous help and the quest was great. I love this pet! This was my favorite part of the entire expansion. I couldn’t wait until I was higher level to start the tame. I think I started the taming adventure at level 92 or 93, finally tamed Gara at level 95. Soloed all way into the void where I was joined by a Troll Hunter towards the end to spawn Xan. All the emotions were had, but highly satisfying once the pet slot was filled. Taming Gara was a blast and yet another reason why hunters are so awesome. I’m not aware of any other classes that have such interesting little side quests and taming adventures. 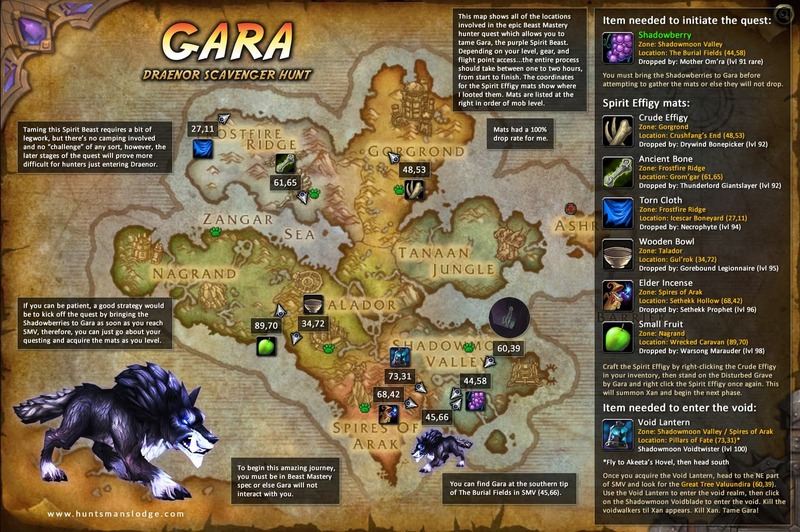 I still need to go for that green fel wolf, but now I’ve been sort of thinking I might level my dwarf hunter during the lull before Legion so that I can try the Gara quest at a low level. I hope Blizzard adds some other interesting hunter-only pet taming quests such as this.